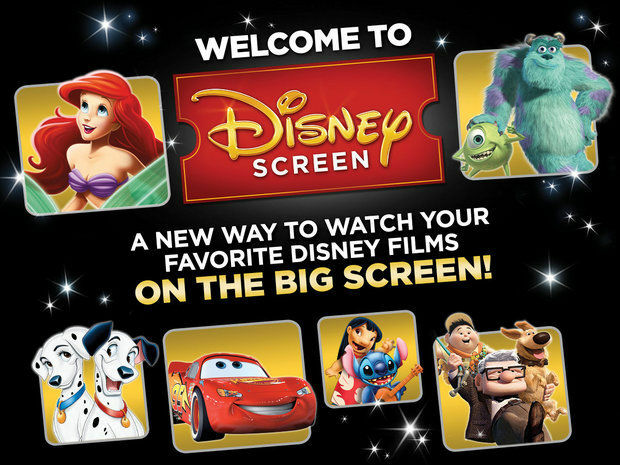 As I mentioned briefly at the end of yesterday's review of THE INCREDIBLES (2004), Disney and Cinemark Theatres are teaming for a new program called Disney Screen. It first rolled out a week ago, July 31st. Disney Screen is basically an ongoing Disney festival, with four Disney films playing at a theater for a week -- one showing of each film per day -- and then after a week the four titles change. 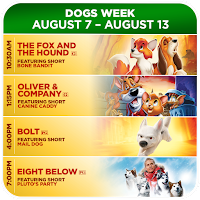 This week, for example, it's "Dogs" week, featuring THE FOX AND THE HOUND (1981), OLIVER & COMPANY (1988), BOLT (2008), and EIGHT BELOW (2006). Next week it's Pixar week, and so on. Although there's not a web link yet, the September schedule is even better, including titles such as POLLYANNA (1960), SWISS FAMILY ROBINSON (1960), and THE ABSENT MINDED PROFESSOR (1961). Each movie is preceded by a cartoon short. The pricing is also amazing; $5 will buy a ticket for a single day; watch one movie or watch all four! There is also weekly, monthly, and quarterly pricing which is equally attractive. The only drawback? Disney Screen is only playing at six theaters in the entire country. I assume this may be a pilot program to gauge interest and that, if successful, it could eventually spread to other theaters. As a Disney fan I'm quite fortunate that one of the six Disney Screen theaters is Cinemark's Century Huntington Beach, one of the local theaters I visit most often. 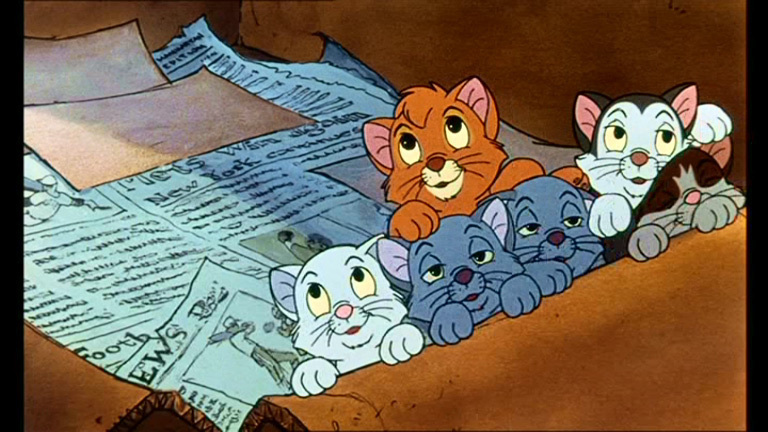 I popped over this afternoon to catch OLIVER & COMPANY, which came out when my oldest daughter was a newborn; somehow I'd never caught up with it in the intervening years! OLIVER & COMPANY was fairly lightly attended, despite it being a Saturday afternoon, and the audience was mostly comprised of adults. I suspect the program isn't widely known about, one week in; I assume there are many families who would take advantage of seeing these Disney films on a big screen if they knew about it, especially given the relatively low pricing. The show started off with a delightful Pluto cartoon, CANINE CADDY (1941). Pluto is serving as Mickey's caddy but is distracted by a taunting gopher. One of the things I really enjoy about Disney cartoons is how well they capture bits of realistic animal behavior mixed in with the improbable comedy. The print looked great. 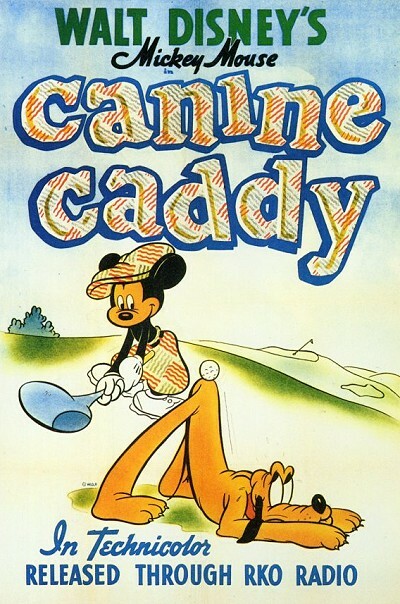 CANINE CADDY can be found on DVD in the Disney Treasures set The Complete Pluto, Volume 1. 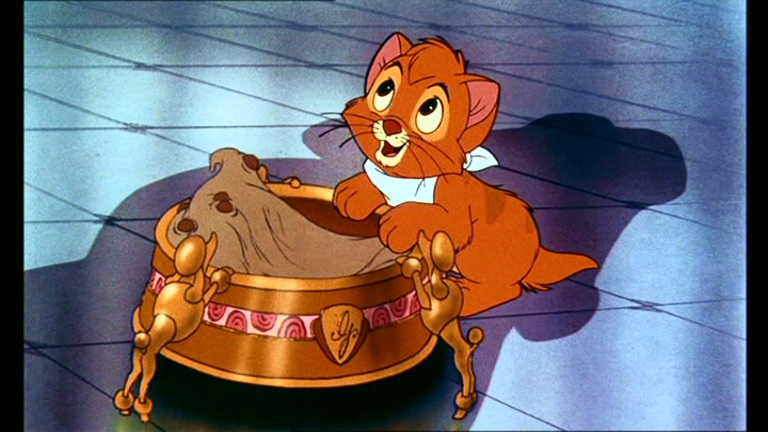 OLIVER & COMPANY is loosely based on Dickens' OLIVER TWIST. As the movie begins, passers-by are taking home kittens from a box on a NYC sidewalk. All of the kittens but Oliver (Joey Lawrence) are selected -- and he's then left abandoned in the rain. As an animal lover, this very sad section was hard for me to watch, even though it's "just a cartoon"! 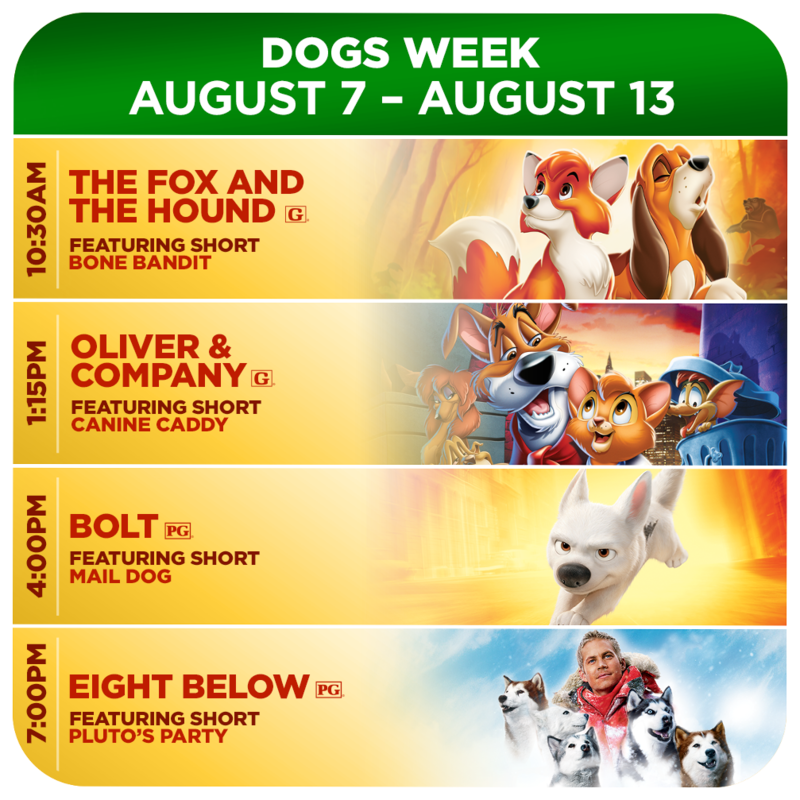 Never fear, Oliver is taken in and sheltered by a scroungy group of dogs led by Dodger (Billy Joel); the dogs steal for a human, Fagin (Dom DeLuise). The crooked Fagin must answer to crime boss Sykes (Robert Loggia), who is one mean guy. There's definitely some darkness in this Disney cartoon, but that's not really anything unusual for Disney, and the movie speeds by so quickly at 74 minutes that any problems are over and done in short order. The sad and scary parts are nicely compensated for by some excellent humor with the animal characters, not to mention Oliver's happy ending with Jenny. I'm not a big fan of the stark animation style of this era, which has a harsh look, but it is what it is. Accepting that and a rather "of its era" musical score, this is an entertaining film with some terrific animal animation. 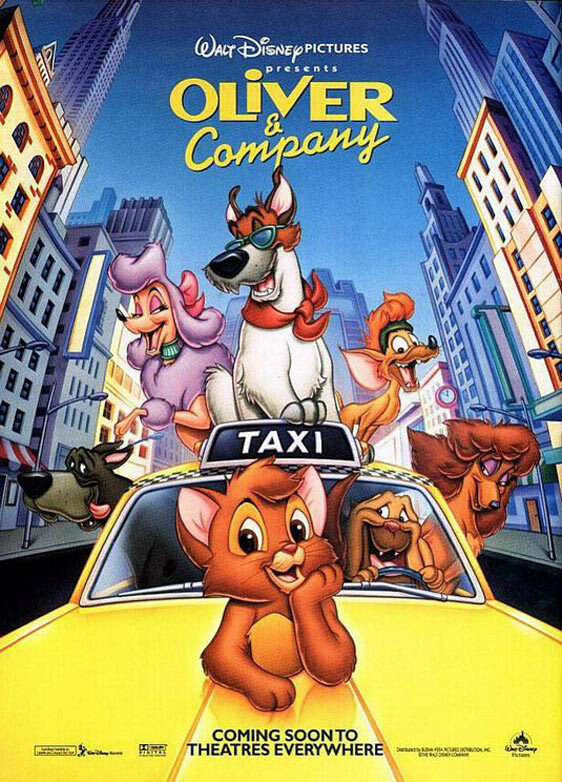 Like CANINE CADDY, the print of OLIVER & COMPANY was in fine shape, and I had quite an enjoyable afternoon at the movies. It's interesting to note that the "Second Golden Age of Disney Animation" was right around the corner, with the following year's release of THE LITTLE MERMAID (1989). 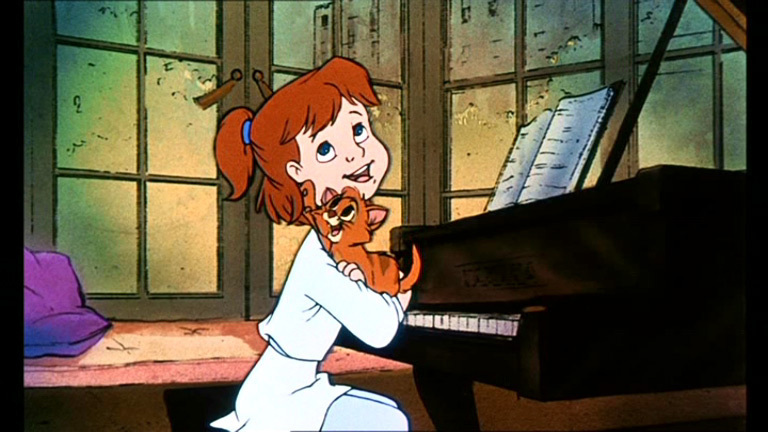 LITTLE MERMAID lyricist Howard Ashman also wrote the lyrics for OLIVER & COMPANY'S title song, "Once Upon a Time in New York City." The initial artwork of NYC in that title sequence made me think of Peter Ellenshaw's matte paintings for MARY POPPINS (1964). 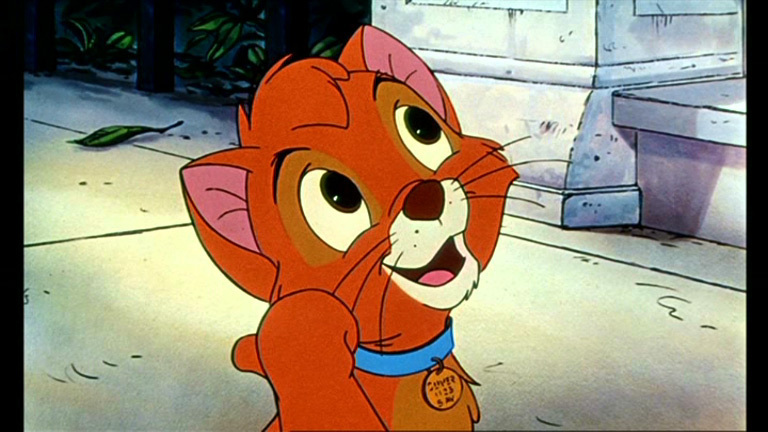 OLIVER & COMPANY was directed by George Scribner. The voice cast also includes Taurean Blacque, Cheech Marin, Roscoe Lee Browne, Richard Mulligan, and Sheryl Lee Ralph. I have no idea why we never acquired this for our Disney shelf at some point over the years! It's available on DVD, Blu-ray, and VHS. It can also currently be rented for streaming at Amazon Instant Video. 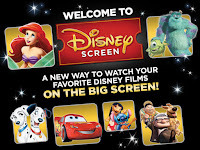 I expect to further report on the Disney Screen series over the next few weeks, and if I learn of the program being expanded to more theaters I'll share that information as well.